It was an emotional laden moment filled with joy, excitement and sense of fulfillment when Governor Akinwunmi Ambode, on Wednesday, granted scholarship and N5 million cash reward to the overall best graduating student of Lagos State University (LASU), Ogunsanya Fuhad Adetoro. Adetoro, who is of the Faculty of Management Sciences, was announced as the best graduating student at the 22nd convocation ceremony held at the Auditorium Complex of the University in Ojo having scored CGPA 4.78. Responding to Adetoro’s request for scholarship to go for masters’ study outside the country, Governor Ambode said he would personally finance the student’s education in any university of his choice anywhere in the world. “In response to the best graduating student’s request, Lagos State Government does not generally give scholarship anymore but only bursary. So, I adopt him. “His story is too compelling and it reflects on my own story. So, any university he wants to go, I will do it personally; I will be responsible. “In addition to that, because he is the best graduating student, I dash him N5 million,” Governor Ambode said. The governor said occasions such as university convocation deserved necessary attention as the future of any nation could only be guaranteed when its youths, who form a majority of the population, are educated enough to contribute to the economy and the continued sustenance of the country. Recalling the pledge to construct 6000 capacity hostel for the institution, Governor Ambode said it was gratifying to report that preliminary works had already been concluded on the project, while work would start in few months, adding that other ongoing projects in the university were on course and would also be delivered on schedule. “Already, preliminary works on the Six Thousand (6,000) capacity hostel for the University which we promised last year have been concluded and in the next few weeks, construction would start. “In addition, the Government’s Legacy Projects in the University including the New Senate Building, the Ultra-Modern Library, Students’ Arcade, LASU Homs (Staff Quarters) and the New Faculty of Management Sciences Buildings are all nearing completion simultaneously,” the Governor said, adding that the projects, when completed, would change the entire overview of the landscape of the University. While alluding to the fact that provision of qualitative education was a cardinal duty which government must render to its people, the Governor said such necessitated the 12.07 per cent allocation for education in the total 2018 Budget of the State, saying the education of the teeming youths remained a priority for his administration. “Our state has always been a trailblazer in various spheres of life and in order to consolidate on the economic gains made so far, the education of our youth is paramount. “We seek the cooperation of all Lagosians to ensure we eradicate illiteracy in the State, groom the next generation of leaders and captains of industry as well as position our State as the standard bearer for the nation in the provision of qualitative tertiary education,” the governor said. Besides, Oguntade charged the graduands to make integrity their watchword, broaden knowledge by reading very well, be bold to take risk and never be afraid of failure, just as he urged them to strive to create a better world for incoming generations. 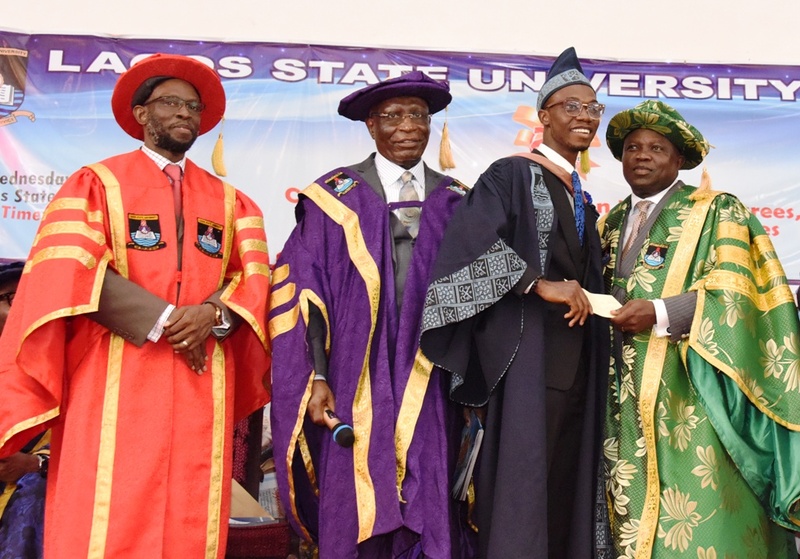 Also, LASU Vice Chancellor, Prof. Olanrewaju Fagbohun, said the graduands have been found worthy in learning and character, saying they have been adequately schooled to contribute to the development of the country. He said due to reforms put in place, the institution ranked first among state universities in the 2018 maiden edition of National Universities Commission (NUC) ranking, while LASU was also selected by NUC as lead institution for the development of blueprints on how to ensure health security by 2050 and blueprint for transportation in Nigeria. He lauded Governor Ambode for the various initiatives designed to promote education in the State and projects executed in LASU especially the RSW through which over 1500 students of the institution had been trained in employability and entrepreneurship skills and Code Lagos programme, among others. A total of 29,710 students graduated with 201 awarded diploma; 21,481 first degrees; 7982 Post Graduate Diploma (PGD); and 46 Doctorate Degrees. In all, 26 students graduated with first class.